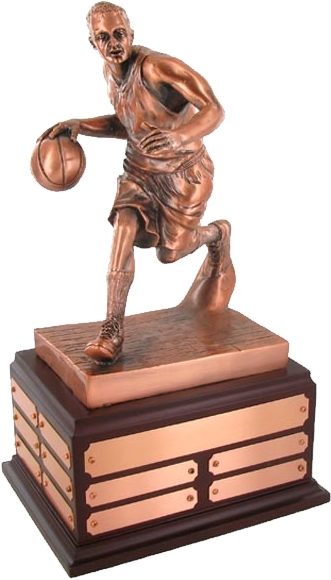 20 inch height Perpetual Basketball Trophy with 9 inch diameter gold ball mounted on the walnut finish base. Comes with 1 header and 8 smaller black screened plates with notched edges. Engraving is available for text only. 19 inch height Perpetual Soccer Trophy with 8 inch diameter gold ball mounted on the walnut finish base. Comes with 1 header and 8 smaller black screened plates with notched edges. Engraving is available for text only. 13-1/2 inch height antique bronze Electroplated Basketball Perpetual Trophy. 8-1/2 inch figure on Rosewood finish base with copper steel engraving plates with notched corners and copper screws. 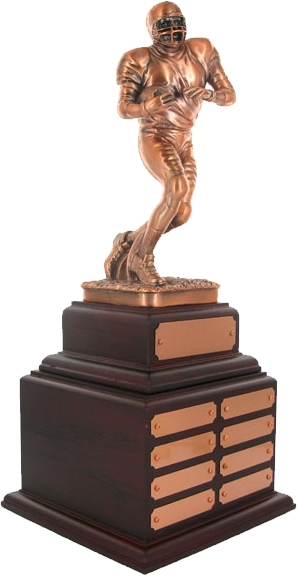 16 inch height antique bronze Electroplated Football Perpetual Trophy. 8-1/2 inch figure on Rosewood finish base with copper steel engraving plates with notched corners and copper screws. 20 inch height Perpetual Bbasketball Trophy with 9-1/2 inch diameter painted resin ball mounted on the Rosewood finish base. Comes with 1 header and 8 smaller copper plates with notched edges. Oxidized engraving is available for text only. 20 inch height Perpetual Football Trophy with 10-1/2 inch diameter painted resin ball mounted on the Rosewood finish base. Comes with 1 header and 8 smaller copper plates with notched edges. Oxidized engraving is available for text only. 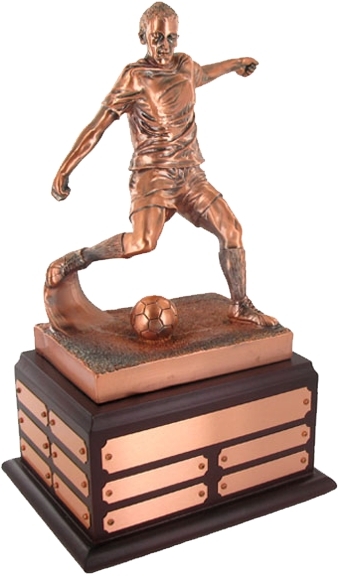 19 inch height Perpetual Soccer Trophy with 8-1/2 inch diameter painted resin ball mounted on the walnut finish base. Comes with 1 header and 8 smaller black screened plates. Engraving is available for text only. 19 inch height Perpetual Volleyball Trophy with 8 inch diameter gold ball mounted on the walnut finish base. Comes with 1 header and 8 smaller black screened plates with notched edges. Engraving is available for text only. 18-1/2 inch height Perpetual Baseball/Softball Trophy with 11 inch diameter gold glove mounted on the walnut finish base. Comes with 1 header and 8 smaller black screened plates with notched edges. Engraving is available for text only. A truly innovative award concept. 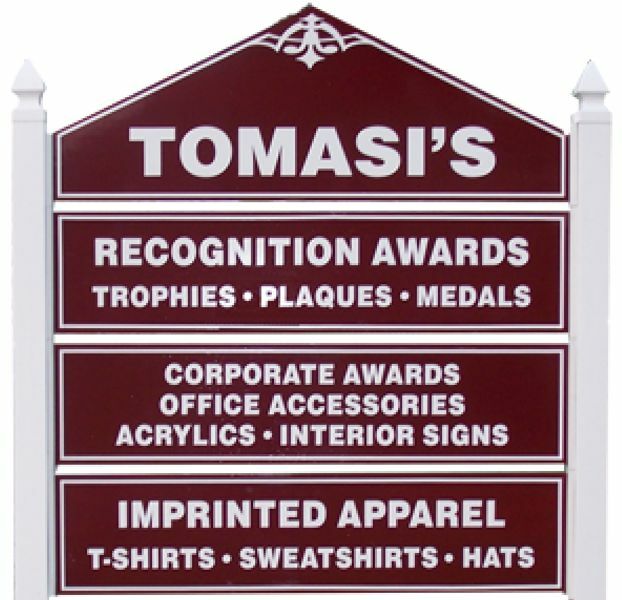 Combines the best features of a trophy with a perpetual plaque, so you can honor the best of the best, year after year! Individual plate size is 7/8 x 2 3/4 inches. Use your own logo or a stock design FREE on orders of 6 pieces or more. Below 6 pieces will incur a $5.00 per piece charge. Black & White (no color or greyscale) camera-ready artwork. Resolution: 300 DPI, File Type: EPS, TIFF, CDR, AI.